Review: Steve Brixton is a big fan of the Bailey Brothers, a series where two brothers solve crime. When he goes to the library for a boring school report he finds out that he, Steve Brixton, is a real detective and when he thinks things are strange enough, things get a whole lot stranger – especially when he finds out about a secret detective agency called the “Librarians”. So he is trying to solve a case with his friend, Dana and things get out of control. Mac Barnett starts off the Brixton Brothers series with The Case of the Case of Mistaken Identity - this fun, exciting book. When Steve Brixton is assigned to American needlework as a school project, he knows it will be a boring assignment. But when he checks out a book called The History of American Needlework strange men break in to the building and try to catch him. He soon finds out about a secret force called the “Librarians”, and is questioned why he checked out the book on needlework. He quickly realizes that they think he is a spy for Mr. E trying to steal the book and give it to him. When he goes to the police they don’t even attempt to help him. 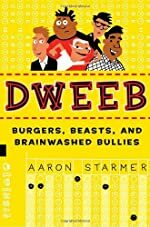 Steve figures out this is his very own case and is off finding out why Mr. E and the Librarians want his book so badly, and also to figure out the mysterious identity of Mr. E.
This book is one of the best I have read this school year. There is not any bad language and is appropriate for school. I would not recommend it for anyone below the fourth grade though. There are some scary descriptions and scary things happening throughout the book. It pains me to say that because I love the book so much. Mr. Barnett did a great job on all of the descriptions, words and everything else in the book. Another thing I really liked was that it had articles of Steve’s favorite book series that say what to do in a bad situation. One example of what to do in a bad situation is “If you are being chased and you can’t find a place to hide, get anywhere above eye level. It will be harder for the enemy to find you because they won’t really think about looking up.” Those entries taught me a lot about what to do if you are in a bad situation. 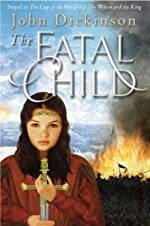 Out of a 5 star rating, I would give it 5 stars because it is a great mystery for children and I loved everything about the book. I hope there are more books coming out for the Brixton Brothers series soon!!!!! We would like to thank Simon & Schuster for providing a copy of The Case of the Case of Mistaken Identity for this review. Have you read The Case of the Case of Mistaken Identity? How would you rate it? Here's some exciting news! 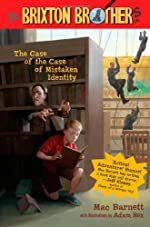 You can enter to win one of three copies of Mac Barnett's first book in the Brixton Brothers mystery/adventure series, The Case of the Case of Mistaken Identity, courtesy of Simon & Schuster. Congratulations to all from Book Trends! Review: “He began his new life standing up, surrounded by cold darkness and stale dusty air. Metal ground against metal; a lurching shudder shook the floor beneath him. He fell down at the sudden movement and shuffled backward on his hands and feet, drops of sweat beading on his forehead despite the cool air. His back struck a hard metal wall; he slid along it until he hit the corner of the room. Sinking to the floor, he pulled his legs up tight against his body, hoping his eyes would soon adjust to the darkness. With another jolt, the room jerked upward like an old lift in a mine shaft.” This young boy Thomas, is just at the beginning of his problems. Soon he will be facing challenges and tests that he never thought were possible. All of this suspense and action takes place in James Dashner’s The Maze Runner, a book that will keep you running until its end! What challenges will young Thomas encounter? Why is he starting his “new life”? What kind of room is this “shank” in anyway? All of these questions will unravel a mystery that will take you by storm! As he exits the cold, dark room, Thomas remembers one thing and one thing only about his life. This is that his name is Thomas. Everything else is a complete blur. About fifty other teenagers, who also do not know anything else about themselves besides their first names, crowd around him all at once. These teens call themselves the Gladers and call the land around them the Glade. The Glade looks just like a settlement, but has four huge doors that close every night. Beyond the doors is a maze that is full of Grievers, strange creatures that can make you go through a horrible thing called the changing. This is very painful and will last for days. It was here on his first day of the Glade that he finds his one of very few friends, a boy named Chuck. Day two is even stranger for Thomas. At one point, he discovers that the Gladers have picked up a kind of slang language during their two years of being at the Glade. Shank (as used earlier) is a name that they would use in substitute of your name. Shuck face is a name that is used to insult. Klunk is the sound that they hear when they use the restrooms. I myself was starting to use the Glader’s slang on occasions. The second day is the strangest of all. A girl, the very first, comes out of the dark room with one message before going into a comma. A note in her hand explains that she is the last of the teenagers to come. Everyone now thinks that Thomas has something to do with this although he has no memory of her. Even later in time, the doors stop closing at night and Grievers are taking one Glader a night every night. Will Thomas and this girl be able to help the Gladers escape the Glade once and for all, or will they all die there, in that maze, one by one? The Maze Runner is an outstanding piece of work that will blow your mind to the very end! James Dashner is a truly talented writer that has the ability to write a book for teens which can hook them on to the very end. Besides his amazing Maze Runner, James Dashner has written The Hunt for Dark Infinity, The Journal of Curious Letters, and The 13th Reality series. I noticed while reading that he has set the book up for the start of a series. From reading this one, I can guarantee to be the first in line for the next book in the series! 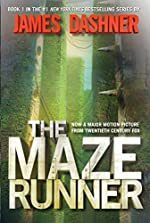 I would recommend The Maze Runner to children of the sixth grade through high school because of bloody deaths and their detail. While reading The Maze Runner, I did not find these parts as defects, but very emotional parts of the story that made me continue reading to discover what would happen next. This book was so well written that I would not be surprised if it won many awards in the time to come. 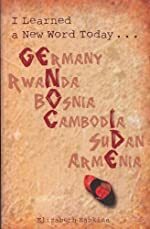 I would rate this book five stars on a rating of one to five because of its high quality and emotional parts such as the many unexpected deaths. The Maze Runner is on its way to becoming a world-wide best seller. There are absolutely no flaws in The Maze Runner. When the book came to its end, I wanted more. I kept rereading the last paragraph hoping that there would be more. James Dashner, you have impressed me in book one by astonishing levels. I could not expect more from a book. I am completely positive that The Maze Runner, and its eventual sequels will keep me fascinated for many years to come! Review: Mischievous, fun, funny, and Zippy, these are all words that describe Calvin Coconut-The Zippy Fix. Calvin Coconut is a nine-year-old boy who has a problem. A teenage girl lives with he and hates her. Be prepared for everyday adventure with Calvin and his friends, Julio, Maya, and Willy. 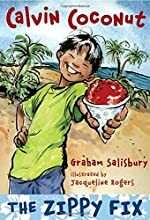 Author Graham Salisbury and illustrator Jacquline Rogers did a great job in writing this book. It is a first in the Calvin Coconut series. When Calvin Coconut’s mom says yes to letting a teenage girl stay at their house, Calvin is mad at her. Too make things worse Stella (the teenage girl) has something against him- He said she looked like a watermelon in a pretty, green dress. She calls him Stump, because when he walks down in his brown PJ’s that is what she says he looks like. Calvin gets so mad that he brings a cat into Stella’s room to make her sneeze (she’s allergic to cats), but something goes terribly wrong. Stella walks out of her room with a puffed face: hives. What gets her really worked up is she has a date with her boyfriend that night. Calvin feels guilty, so guilty that he even considers confessing. At the dinner table Calvin’s mom asks Calvin if there was any way that a cat might have gotten into the house. He says no, but the “crummy feeling” won’t go away. When Calvin finds out that Stella’s birthday is on Monday (it’s Saturday) he want to get her, her idols’ CD, but it’s 18 dollars. What will he do? Will Calvin get Stella the perfect present, or will he fail? Overall I thought that Calvin Coconut-The Zippy Fix was a good book. I will start with the good points. First of all, the story line is fun, and realistic. The author does a good job of making Calvin’s voice come out. 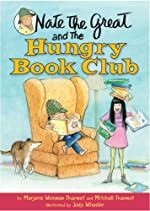 For example, in the story it says: “The Crummy feeling still wouldn’t go away.” Also, if a teacher could easily use this as a read aloud, first because it is appropriate, and second of all her students could use strategies while their reading. For example at the end of chapter 17 it shows that a teacher could use this for practicing predicting. While Calvin Coconut-The Zippy Fix was appropriate, some of it was questionable for a younger age group. For example, the author makes Stella a very vicious character in the beginning, and one of Tito’s (Calvin’s arch enemy) friends is named Bozo, which could be offensive. Overall I thought that Calvin Coconut-The Zippy Fix was a decent book, and I rate this book 3 of 5 stars. We would like to thank Random House for providing a copy of Calvin Coconut: The Zippy Fix for this review. Have you read Calvin Coconut: The Zippy Fix? How would you rate it? Review: When Catherine Locke (a.k.a. Cat) dreams up a science project for the science fair, her life begins to change. She faces popularity issues, hunger pangs, old friends, competition and life as a prehistoric woman. She cannot use technology like phones and ipods. She cannot eat food prehistoric people did not eat, except during emergencies. Will Cat be able to accomplish this extreme project? 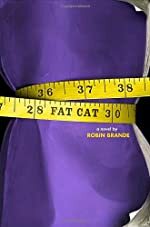 Find out the answers to these questions in the book Fat Cat by Robin Brande. In the book Fat Cat, The main character Cat, has a problem. When Cat is assigned to do a project on Homo erectus, (early hominins from 1.8 million years ago) she decides to make the subject of the project herself. Her project is to see what would happen if she took away everything Homo erectus don’t have, because she thinks it could make her skinnier. Cat thinks she’s fat. This incredible task includes food Homo erectus didn’t have, plus, phones, ipods, and TV! Her friends, (Amanda, Cat’s best friend) and Jordan (Amanda’s boyfriend) are all there to support her. Oh, and don’t forget Cat’s arch enemy Matt. He’s her enemy because she is convinced that he took first place from her in a previous science fair and he said something pretty nasty about her behind her back. When she starts going from fat to normal and not cool to popular, her life begins to unfold page by page. Fat Cat is a pretty good book. 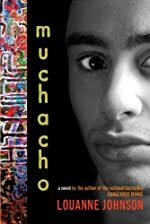 In my opinion, this book should be recommended for older middle school students since they will most likely enjoy the book. If I were an eighth grader when I read Fat Cat I would probably have said that the book was interesting because it mixed daily life and science together. 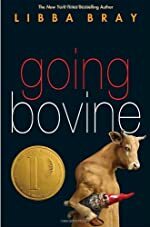 From this book I learned that you can’t give up something important just because you think it’s too hard and you should look at things from a positive view. The book shows what happens when you do certain things such as getting off junk food when you have practically been living on it the whole summer. It also shows that maybe trying to cook with only the food that the Homo erectus had is trickier than Cat thinks. In the book it says “Even if my cave woman had grain, it’s a separate thing to say she figured out how to mill it into flour.” I chose this sentence because it shows the problems of trying to cook with only the food that Homo erectus had. I would probably give these book 4 stars. This book was exciting funny and made me laugh. The author did an excellent job with Fat Cat. I hope everyone else will enjoy Fat Cat like I did. We would like to thank Random House for providing a copy of FAT CAT for this review. Have you read FAT CAT? How would you rate it?